For agency marketers, there's rarely enough time in the day. Account management. Content creation. Social monitoring. Report writing. Client-facing presentations. The list of tasks goes on and on and on. It's a delicate balancing act - and with so many reports and different data sources, keeping track of performance can be overwhelming and massively time-consuming. 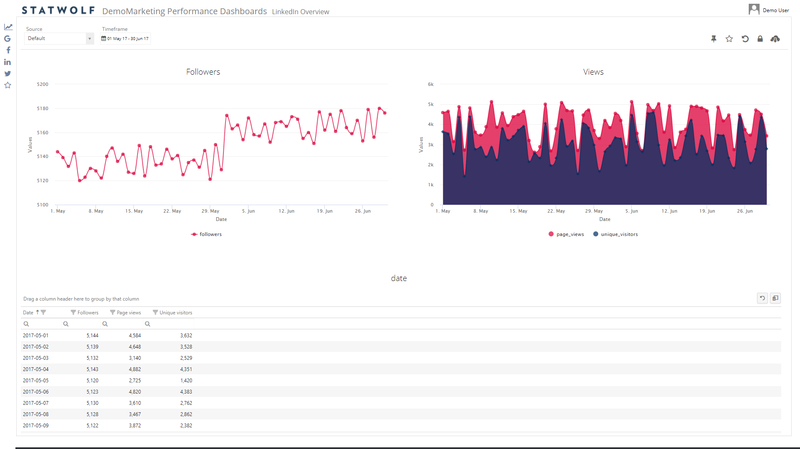 Statwolf's marketing dashboard automatically pulls everything together, offering a simple, complete view of your digital performance. 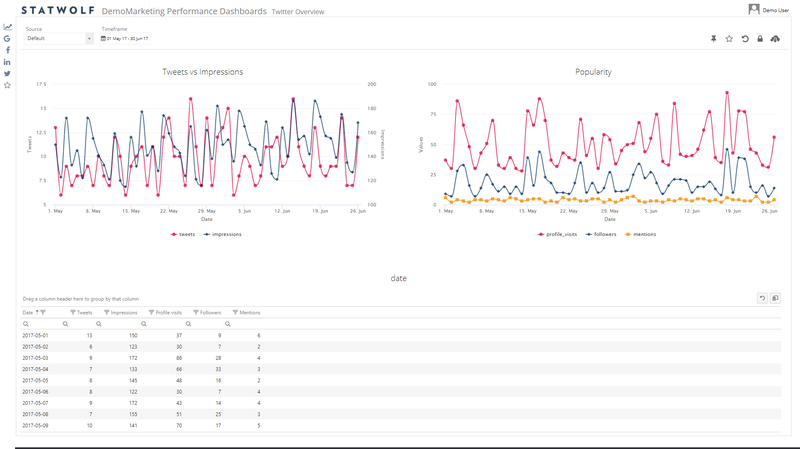 It integrates seamlessly with major web platforms, including Google Analytics, Facebook and LinkedIn, displaying results on one simple dashboard. 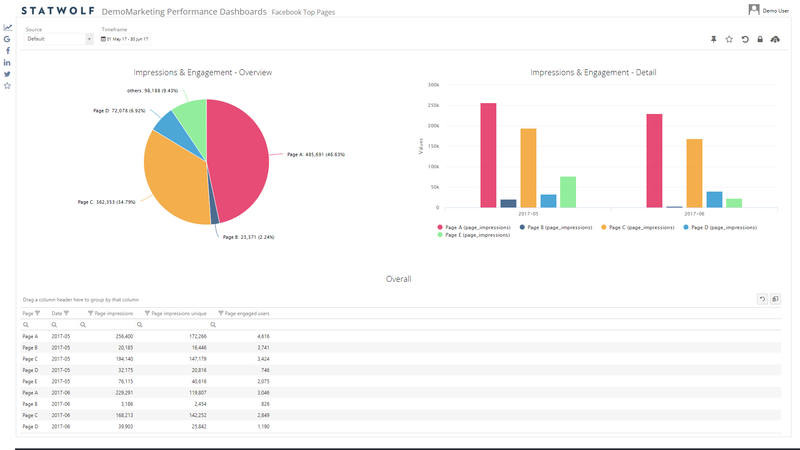 Data can be visualised instantly, helping you quickly see what's working so you can efficiently generate progress reports and take action to modify your marketing activity. You'll also gain powerful insights into consumer behaviour, which can be applied to future campaigns. With three tiers of service, we've made it simple to choose the one that best suits your needs. Multiple levels of analysis: overview, comparison and in-depth analysis. Customised with your own branding by default. No new installation required. Statwolf also integrates with existing BI solutions like Tableau and SAS. Standard and White Label, to meet your clients’ needs, regardless of the amount of data involved. Kick-Off webinar to help you get started. User guideline documents provided too. 2-year data retention guarantee. Ongoing platform maintenance support. Get your reports in the Excel template you prefer, and download them directly from your browser on a regular basis. 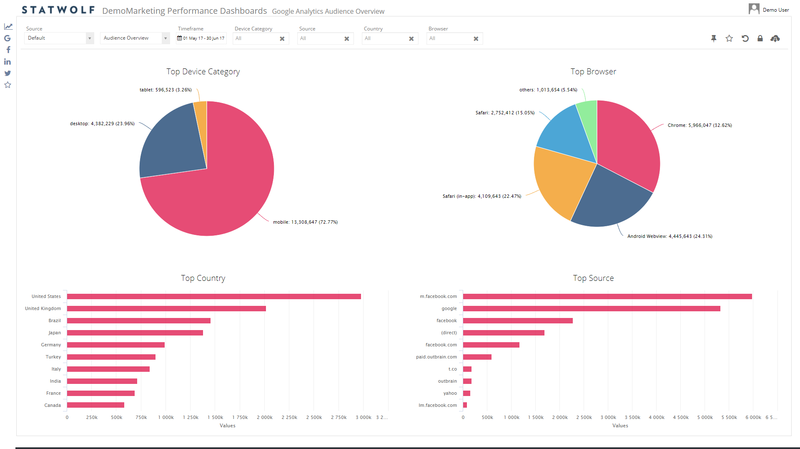 You can create your own dashboards and run custom analysis in complete autonomy, providing total flexibility. No installation required. We define a web property as a point of presence on the internet that belongs to the company whose identity is associated with it. Your company website (e.g. yourcompany.com). A different domain of your company website (e.g. yourcompany.ie). A single social network account (e.g. “Your Company” Facebook account). A social network account managed by your company for different purposes/languages/customers (e.g. “Your Company - Italia” Facebook account). However, something like your company’s review pages on sites like Amazon are not actually web properties, as they aren’t owned by you.